If I could have one outfit right now it would be this one. No joke. 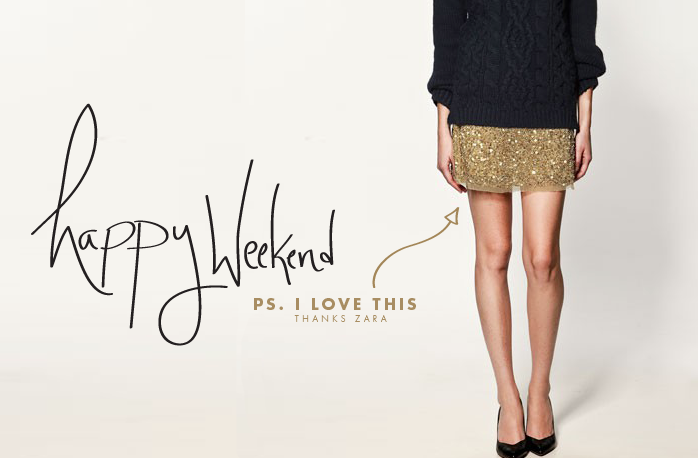 I am not too much a sequin girl but that chunky sweater with that skirt makes my heart want to leap from my chest. It actually would be perfect to wear to my friends, Bryan and Mae’s wedding tomorrow! Yeah that’s right they are getting married and I cannot wait to head down tomorrow and see them become husband and wife!! Yeah now that is going to make my heart jump out of my chest I think out of pure joy. I tell Mike all the time how much in love with love I am and it is no joke. I am a total sap about things like that. Other than that this week I have spent prepping for our first Blog Brunch on October 1st. We are setting up a blog to keep in touch with everyone and for you all to interact with. We cannot wait to get this thing really moving. If you are attending make sure to grab the badge over on the website so you can tell everyone where you will be every first Saturday of the month. Also this week I have been putting a new face to my design studio. Yes I design when I am not here writing…not sure how I find the time to balance them both all the time but I do and I love it. But Hitch needed a little facelift so I revamped the logo and got a new portfolio site up. So excited for you all to check it out and to see the new logo so head on over to the new Hitch Design Studio site. Now for some weekend links for you all! 1. This shoot from Jose Villa is making me wish for endless summer and romping in fields. 2. I have been obsessed with this room design by Emily Henderson. I love all her work but this room is one I could live in very easily. 3. These images for the knit company Good Night, Day that were on Miss Moss’ blog this week were so beautiful. 4. Do I need to say anything other than the sneak peak of Rue’s Anniversary issue? Yeah didn’t think so. 5. I have been thinking of making my own ketchup for a while and now one of my fave sustainable living blogs, Crackers has done it and it made me want to do it even more! Don’t forget I blog on Fridays at Simply Blue Weddings with some great wedding inspiration every week as well.